"You can do this." 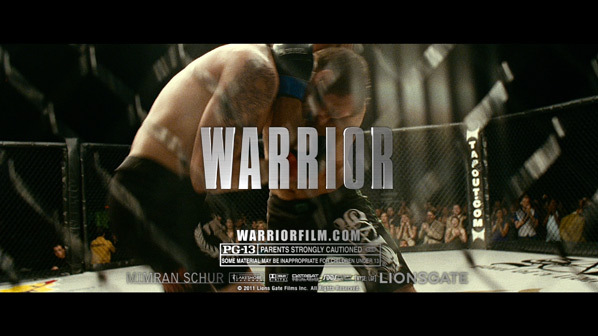 Lionsgate asked us to exclusively debut their newest TV spot for Gavin O'Connor's Warrior today, and I certainly had to say yes, as I love this film and it's finally about to hit theaters. Warrior stars Tom Hardy and Joel Edgerton as brothers and former MMA fighters and Nick Nolte as their father. The film had sneak previews this past weekend, and this one of those TV spots that features audience testimonials, since almost everyone who sees it, loves it. It's hitting theaters this weekend, and it's definitely worth seeing - if you need a full trailer, here it is. Like she says in this, "you have to see the film!" The youngest son (Hardy) of a former boxer returns home, where he's trained by his father (Nolte) for competition in a MMA tournament -- a path that also puts him on a collision corner with his older brother. Warrior is directed by American filmmaker Gavin O'Connor, of films like Tumbleweeds, Miracle, and Pride and Glory previously. The screenplay was written by Anthony Tambakis, Cliff Dorfman & O'Connor from a story by Cliff Dorfman ("Entourage") & Gavin O'Connor. This was filmed back in 2009 mostly in Pittsburgh and Atlantic City. Lionsgate is finally bringing Warrior to theaters starting September 9th this weekend. One of the year's best films, Warrior will be No. 1 next week at the box office and there will be Oscars for all involved. It's written in the stars. Saw this on Sunday night. Hands down, best movie of the year. As previously mentioned everyone involved deserves an Oscar. Hopefully the academy won't snub this film because of the mma backdrop. Sadly I can`t find a release date in my country , I am really looking forward to this. First off, I have not seen this film, and keep that in consideration as I continue. Is it just me or does anyone else feel like they've been beaten to death with trailers for this film. I genuinely wanted to see this film when I first saw this preview, but I have seen it so many times now that the sheer thought of going to see this movie right now annoys me and fills me with a bit of distaste. I think it looks like a good movie, and don't doubt the hype....but I Seriously think this preview was before every movie I saw this summer, and I'm beyond tired of it already without even seeing the movie. This is mostly just a rant about the over publicity, as I will probably see this...not this weekend...but eventually. Looks good..but, every douche bag that is a wanna be fighter will be all pumped up and high on douchery in the theater.